Snacking on fruit at work is not just about good health for staff but to overall business’ health too. 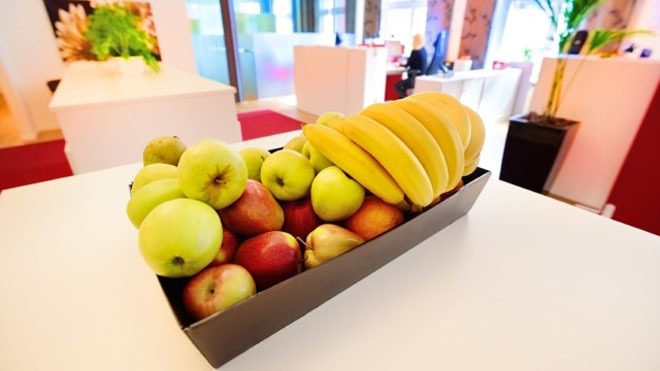 Take a look at the top reasons why fruit can make a real difference at your workplace. 1. Fruit improves staff morale and wellbeing. Research confirms that company morale is stronger in organisations that provide health and wellbeing support to their employees. 2. Fruit stimulates the memory. Although the way it works is as yet unclear, much research is being undertaken to find out just why fruit is the ultimate brain fuel. What we do know for a fact is that if you consume fruit effectively, your brain can recall information faster and more easily. 3. Fruit makes you feel better. It’s a proven fact that people who are frequently depressed lift out of their depression slowly but surely after consuming substantial amounts of fresh fruit on a regular basis. To get the best out of fruit’s nutritional benefits, eat it on an empty stomach around 20 mins before your other meals. This way, the fruit won’t ferment in your tummy and all the health-promoting benefits can be effectively absorbed by the blood. 4. Fruit helps hydrate your body. 80 per cent of our body is water and the same goes for most fruits too. There’s no other food on the planet that contains this much water, making them the logical choice to help keep your body fresh and hydrated. 5. Fruit is 100 per cent bad cholesterol free. With so many unhealthy choices around, it’s good to know you can always pick up a piece of fresh fruit and simply know it’s packed with goodness. Improvement of staff performance through good health and morale. A reduction in the number of worker’s compensation claims. A decrease in staff recruitment and training costs due to reduced staff turnover. Increased employee loyalty and commitment. Help your employees be healthier and happier and order an Office Fruit Box from BuyFruit.com.au today - guaranteed fresh & handpicked.